Thanks for requesting our? 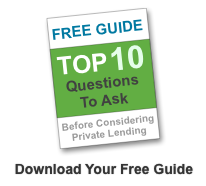 ?“Top 10 Questions to Ask before Considering Private Lending”??report. The purpose of this quick report is to help those of our website visitors who are interested in private lending. We will answer some of the common questions that you are already considering or have not even thought of yet. Whether you will work with someone you know and trust, or you are considering trusting a real estate investing firm you don?? ?t know, it is important for you to be in control so you can protect you interests. This is only possible if you have asked all the right questions and done your research. If you have more question after reading this report, don?? ?t hesitate to contact us. We will help you with more information so your questions are answered. You can also contact a reliable real estate investment firm near you that can help you with your queries. We will email you more information and resources to help you out so check your email account. If you would like to talk to us and learn more about our work, feel free to contact us anytime. We are here to help you.